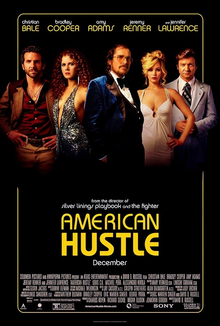 American Hustle tells the story of the Abscam scandal in the late 70’s, when several high profile congressmen in the US were arrested as part of a corruption sting. It’s focused primarily on the people involved though, mainly Amy Adams and Christian Bale’s conmen, who are arrested and roped into helping the FBI make some big arrests. Their handler is Bradley Cooper’s Agent Di Masso, who isn’t as prepared as he thinks he is to enter this world. It’s essentially a strong character drama against the backdrop of an almost heist like scenario, and the film’s main strength is the splendid production values to recreate the 1970’s, and most of all, the superb acting from all involved. It’s not a perfect film, it’s a bit too long, takes it’s time to get going and doesn’t delve into the morality of arresting politicians who were essentially trying to do some good (albeit in the wrong ways), but it will undoubtedly pick up some acting awards, with Bale and Adams both the standouts in an excellent cast.